Having selected proper light waves, researchers at the Center for Molecular Spectroscopy and Dynamics, within the Institute for Basic Science (IBS) have demonstrated a more than 10-fold improvement of light energy delivery to targets that are too deeply embedded to visualize with current optical imaging. Able to picture through a young mouse skull in the laboratory, this non-invasive technique does not cause any damage to tissues and does not need injections of fluorescent molecules to label the target. Published in Nature Photonics, this work might lay a foundation for in vivo experiments that use light in biomedical imaging, optogenetics, tumor treatment, and for recharging implanted medical devices. Entering a complex and opaque environment like a human or animal body, light trajectory is deviated by all the components it finds on its way. For this reason, only a small fraction of light waves propagating inside biological tissues can actually reach the desired target, while the majority is scattered and randomly diffused. This multiple wave scattering hinders most applications of optical imaging for deep biological samples. IBS scientists found a strategy to maximize the intensity of waves that interact with the target over the waves that do not, which depends on the time it takes for the waves to travel to the target and be reflected back. 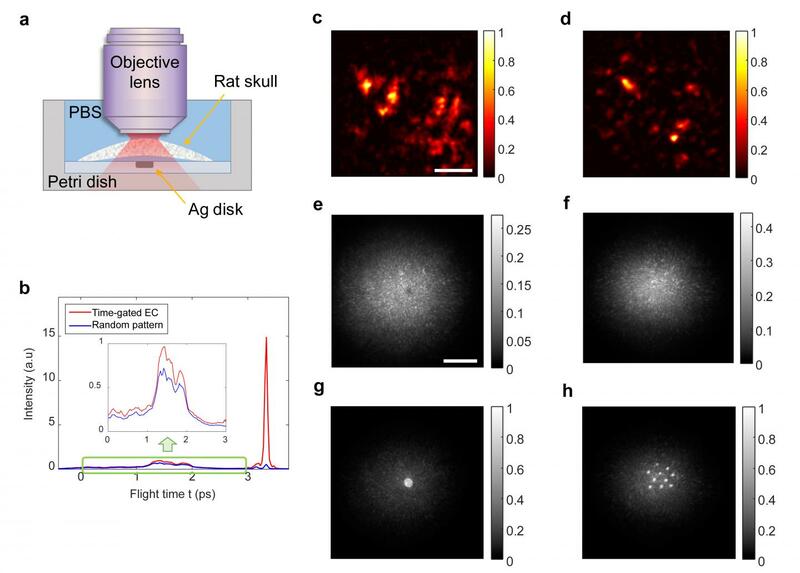 After having verified that theoretical predictions and experiments matched, IBS scientists applied the technique to a 340 μm-thick young mouse skull. They placed either one or ten silver disks below the skull as targets, and immersed them in a biological serum that simulates conditions of living tissue. The new technique, which registers only the waves that reached the target, worked better than collective accumulation of single scattering (CASS) microscopy. "Optical imaging can generally work at the depth of 1 transport mean free path; roughly 1 mm of biological tissue. Our technique goes deeper into tissue, at nearly twice the depth," details Seungwon Jeong. While previous studies have looked at targets outside of the opaque environments, this study took it much further by placing the target in biological fluids. The target needs to reflect light more efficiently than its surroundings. For example, the scientists suggest that the technique could be used to visualize myelin, the lipid layer that wraps neurons and guarantees fast transmission of electrical signals, because it has a larger refractive index than the neurons it surrounds. The team hopes to apply this method to the nerve cells, bone marrow, and brain tissue of living animals and humans.